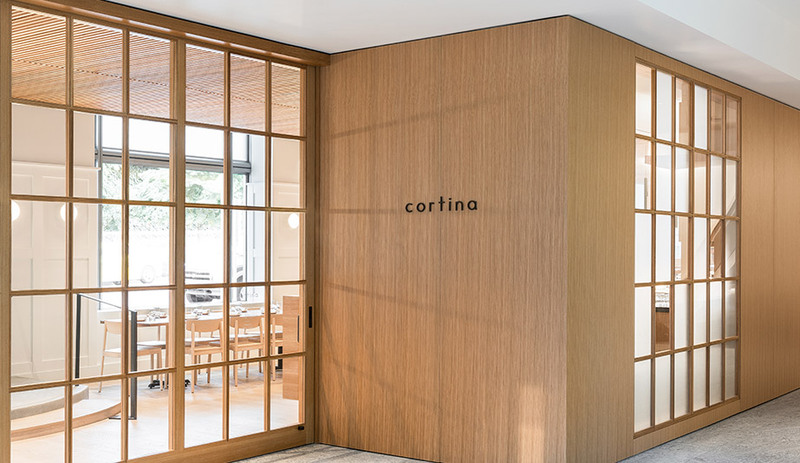 Abundant natural light and a sophisticated urban setting steered Heliotrope Architects’ design for Italian eatery Cortina in Seattle. 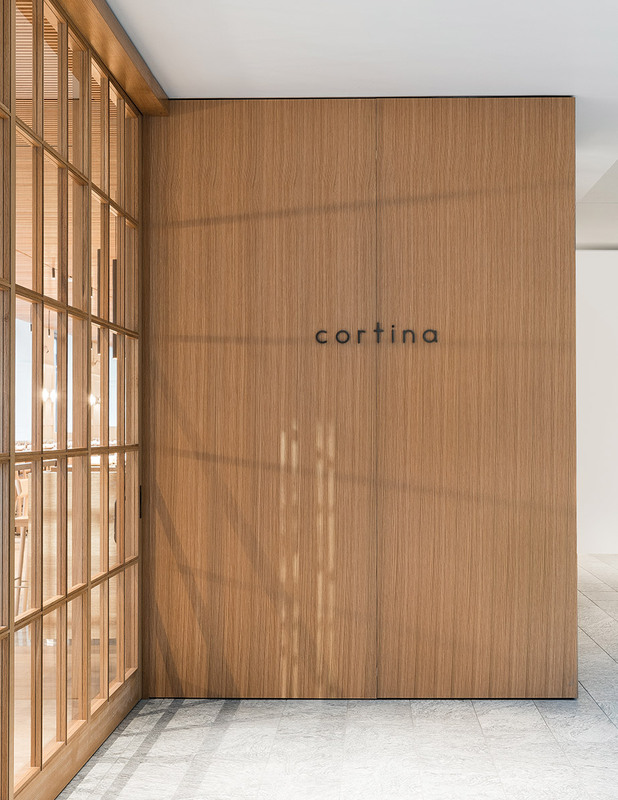 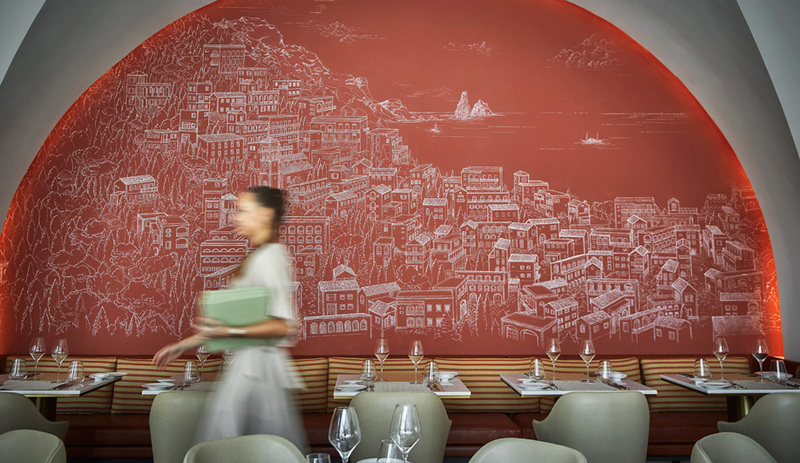 When it came to crafting the interiors of Ethan Stowell’s new Italian restaurant Cortina in downtown Seattle, Heliotrope Architects knew it should reflect a sophistication befitting its urban surroundings. 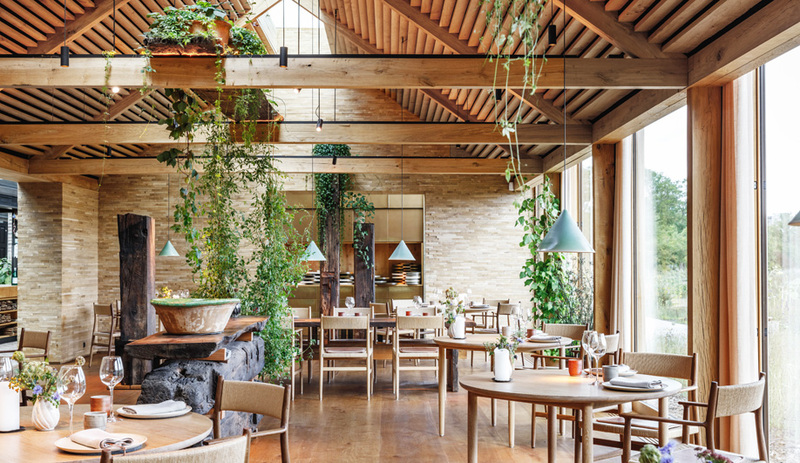 Situated at the base of Two Union Square tower, the 74-square-metre space came with more than 30 metres of street-level glazing that floods the restaurant with bright, natural light and offers an opportunity to connect with passersby. 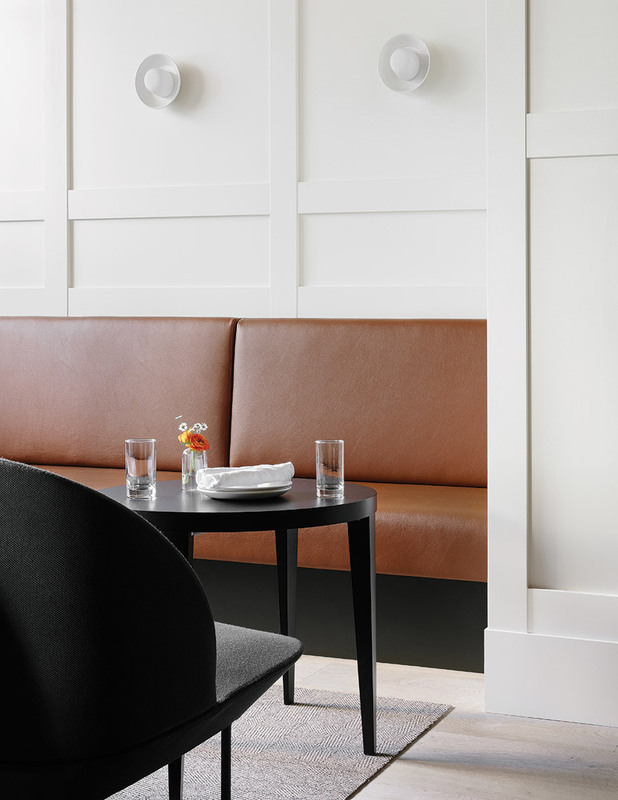 In response, Heliotrope, led by principal Mike Mora, composed a palette of white, wood and warmth as a refined backdrop, tempting those on the outside to venture indoors. 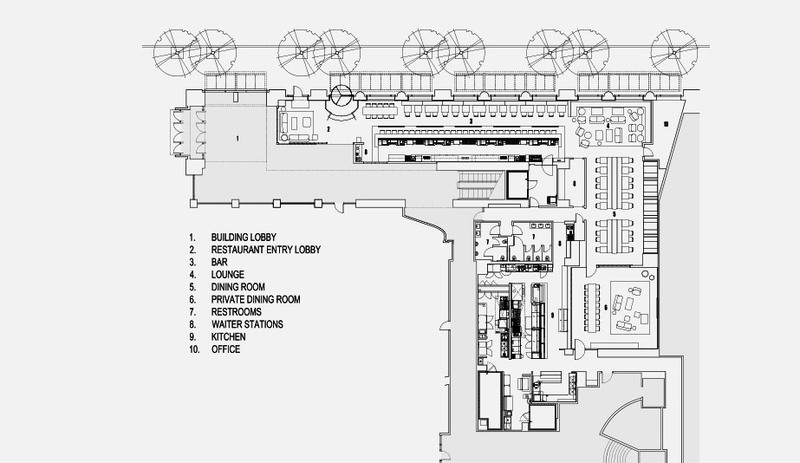 Its location within the tower means the restaurant benefits from two entrances, one from Union Street and one from the lobby of the building itself. 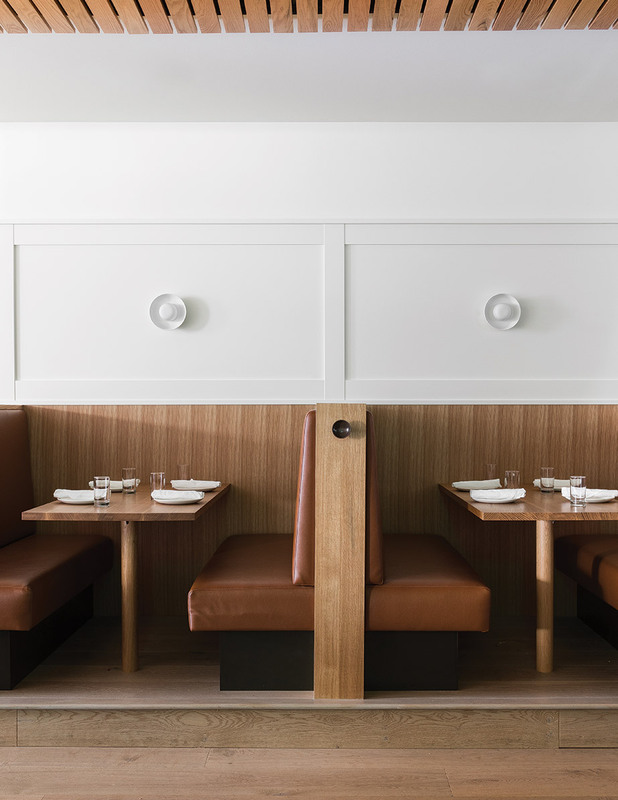 Previously a steakhouse, the internal entry point had been dark and more closed-off than what was desired. 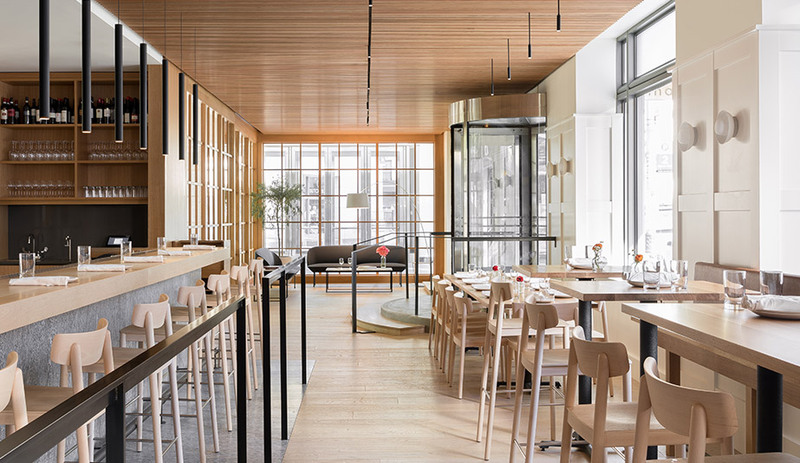 To lighten the mood and provide a sense of transparency, Heliotrope replaced solid walls with a lift-and-slide window system framed in white oak. 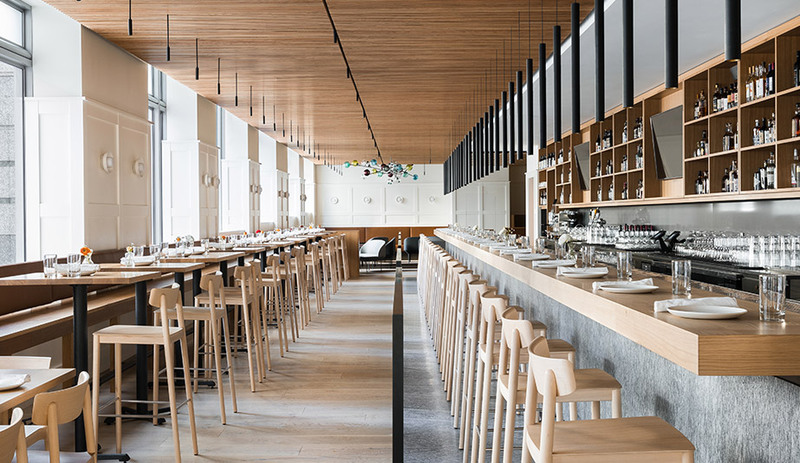 Taking prominence is the white oak bar itself, which spans nearly 20 metres, seats 32 and informs the rest of the restaurant’s layout. 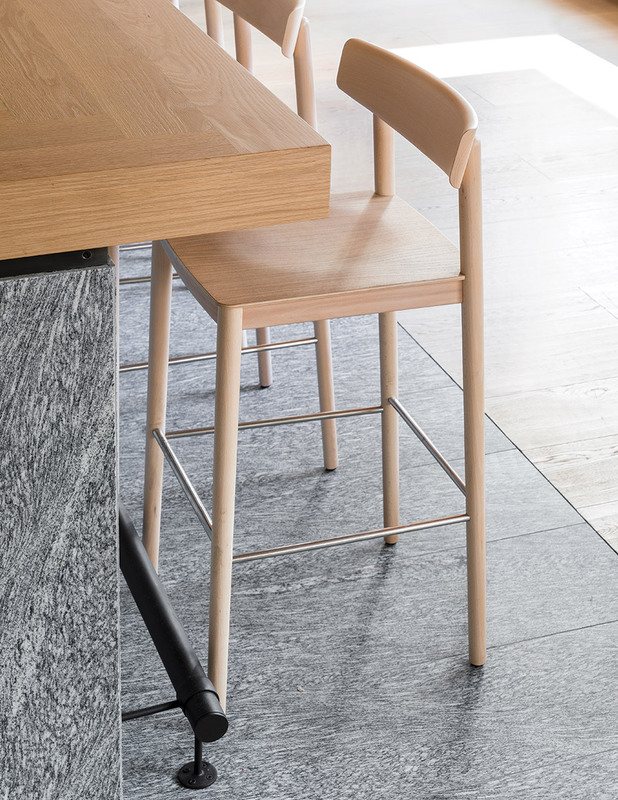 Grey granite on the bar face and floor is paired with a grey Caesarstone backsplash, both of which add a handsome finishing note. 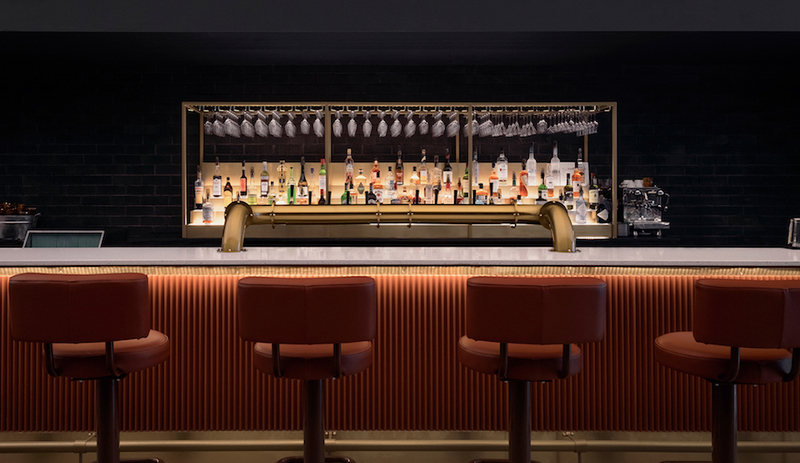 Casework behind the bar is a series of repeated boxes that enhances the overall rhythm. 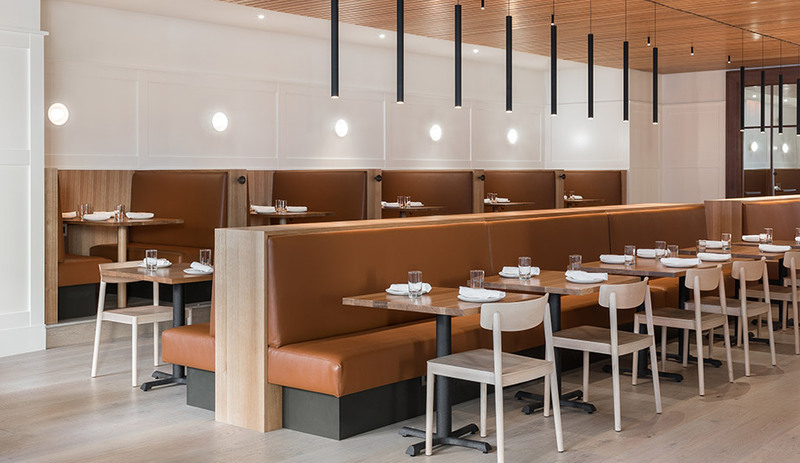 Suspended from the red oak slat ceiling system, three rows of perfectly aligned inky black pendants of differing but complementary styles punctuate the space and help draw the eye through the lengthy room. 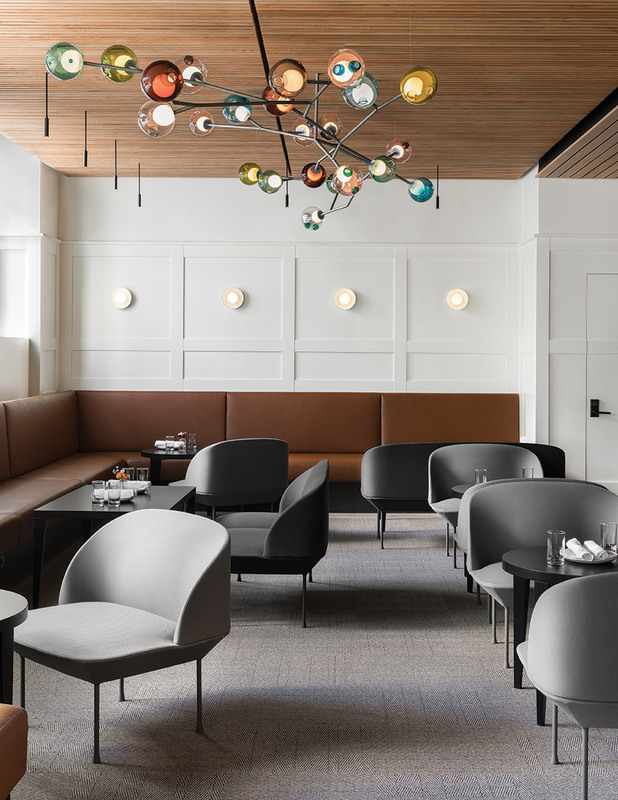 Hovering above the back lounge area is an organically shaped 28 series chandelier by Bocci (above), bringing the only touch of colour. 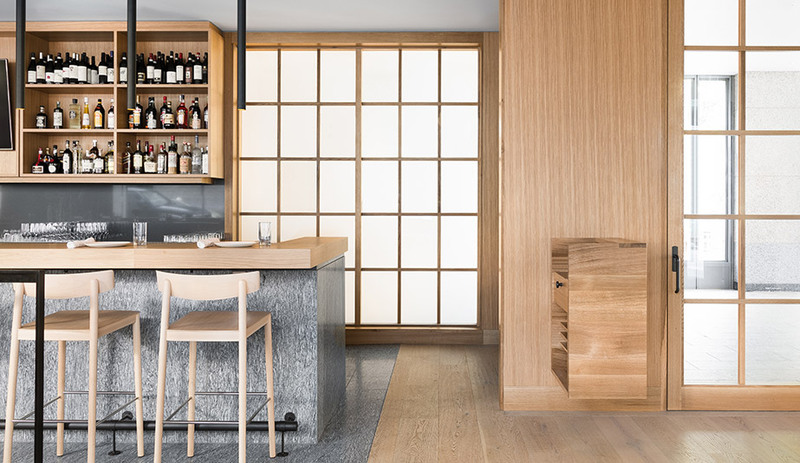 On the walls, this repetition strategy played out through a continuous run of stile and rail panelling, a traditional woodworking technique that manages to feel current thanks to its crisp white paint and contemporary Hoist sconces by New York studio Rich Brilliant Willing. 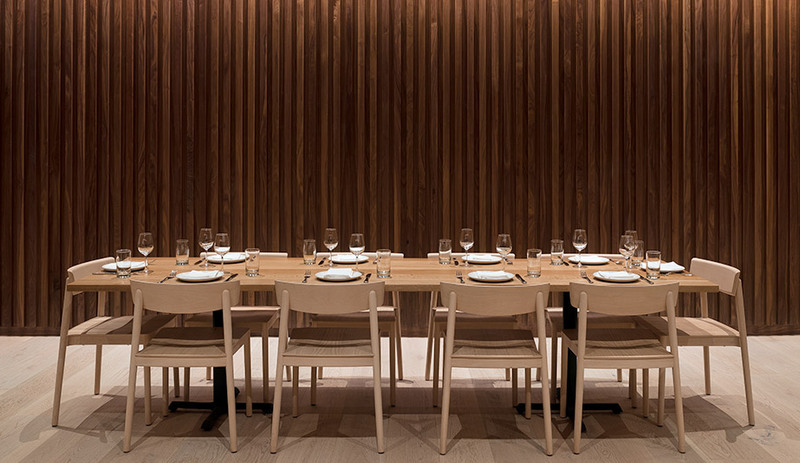 The white is complemented by warm rift sawn white oak tables and booths. 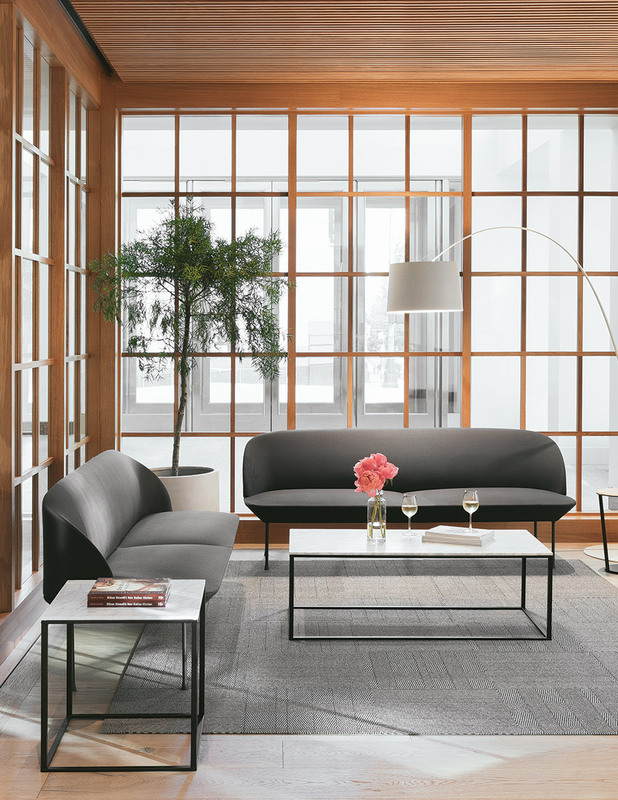 The overall result of Heliotrope’s design is one that is bright and contemporary, mixing natural light with refined elements and materials to deliver a well-polished space.